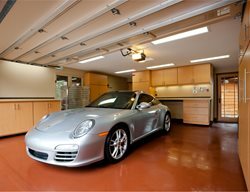 The owner of this garage wanted an uncolored polished concrete floor that would showcase his Porsche collection. 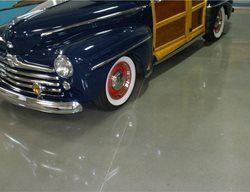 The floor was polished with 40, 80 and 150 metals, then densified with Consolidecks LS. Next it was polished up to 1500 grit and sealed with two coats of burnished Consolidecks LS Guard. 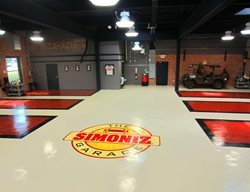 Winner of a 2012 ASCC Decorative Concrete Council Award - Second Place Certificate for Multiple Applications, Under 5000 SF. 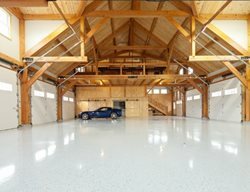 Winner of a 2012 ASCC Decorative Concrete Council Award - First Place Certificate for Epoxy Polyaspartic, Under 5000 SF. 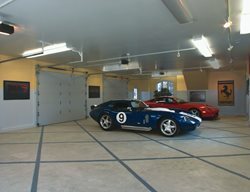 This garage has it all. 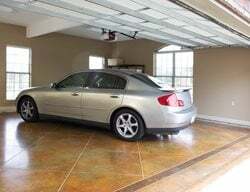 It's a five car garage shaped like a horseshoe with an office, lounge, bar, car wash bay and detail area. 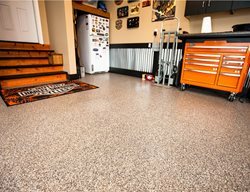 The floor has a subtle checker flag design that utilized the existing saw cuts. 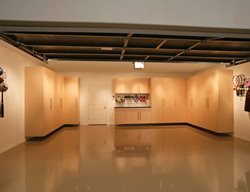 Each bay has four 12-foot squares with a polyaspartic quartz finish from Surf Koat. Diagonal squares were colored to match. One color was a mix of black and gray with gold metallic flakes and the other was a blend of light and dark gray with silver metallic flakes. 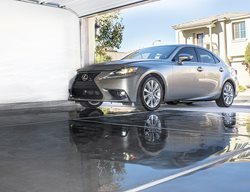 This residential garage floor was polished. 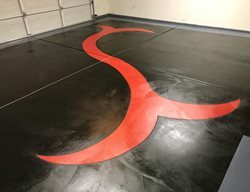 The customer’s logo scored into the surface and custom dyed. 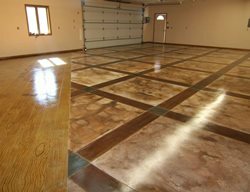 This Las Vegas residence features Cola stained concrete with a random block pattern down the middle. 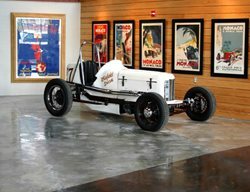 This concrete floor at the Tom Ahl Chrysler was stamped with Brickform’s Slate texture mats and saw cut into 2’ squares. 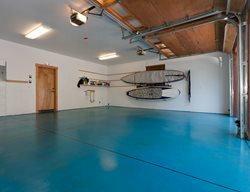 The floor was then stained with Smith Paint’s water-based stains in Desert Sand and Bark Brown and then sealed and waxed.